One of those creative thinkers was Michael Crichton. "I have an unusual experience of Johns because I have looked at him as a writer and because he has been such a profound influence on me for so many years." Congratulations, Jasper Johns. And thank you for the inspiration you gave to Michael Crichton. 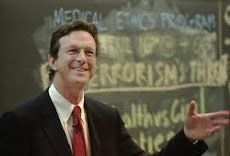 Enjoy this post from last year about Michael Crichton on love. What was Michael Crichton’s first published article? Some sources claim it was a travel article, “Climbing Up a Cinder Cone”, about Sunset Crater National Monument, which was published in the New York Times on May 17, 1959. The operative word here is “sold”. While Crichton may have sold the article when he was fourteen, it wasn’t published until May 17, 1959. As Crichton was born on October 23, 1942, that would have made him sixteen when the story was published. This would not have been unusual. Newspapers often purchase stories that are not timely, especially travel and other feature articles, and hold them until a story is needed to fill a space. Sunset Crater is centuries old and had been a national monument since 1930, so it was safe to assume it wasn’t going anywhere. In interviews and in Travels, Crichton is careful to say only that the article was sold when he was fourteen. He does say that the New York Times ran it but he doesn’t say when. Crichton was not being misleading; people who are unfamiliar with how newspapers operate would be confused by the delay. Crichton goes on to say that he started working for the local newspaper, so it’s possible that another of his articles was published before the New York Times piece. “Climbing Up a Cinder Cone”, which can be purchased for $3.95, is an impressive article for a 14-year-old. Even though I’m certain it would have been edited before publication (every writer gets edited), it remains an amazing achievement.